In cool weather, car was was VERY hard to start, and when it fires, it does it so only on a couple of cylinders and only runs smoothly after a few more seconds. Found the Cold Start Valve not getting a ground during start sequence (Manual shows this model year is fed timed 12v by the ECU during start, but other side is permanently grounded). No Thermo Time Switch installed. I provided a new ground for the Cold Start Injector and car seemed to start and run perfectly immediately. Then the "good starts" became intermittent (sometimes car starts perfectly, other times long crank) and there would be a cold hesitation on acceleration following hard starts. When it starts properly, you'd never know there was anything amiss. Luck of the draw on whether you get Jekell or Hyde on any particular cold start. Thinking possible fuel contamination (a few drops of water of some solids moving about), I drained tank, and removed/drained or blew out fuel pumps (2) filter, all lines, CIS distributor, lines, injectors. Checked regulated pressure (80psi) and residual pressure (38psi held for hours). Pulled start injector and checked spray pattern (perfect), but the rubber hose it sprayed into was somewhat fouled, so removed it and cleaned it. Removed the Auxiliary Air Valve (in this model Aux Air Valve air is sucked past the cold start injector and introduced into the intake manifold with the auxiliary air) and it looked clean, but tested with "pulsed" 12v to see if it activated (it click and rotated inside). Still, some starts are PERFECT. Starts and runs smoothly immediately, while others are awful (long crank, and takes seconds to run smoothly). Even when it starts and runs perfectly smoothly, the idle never varies from about 750rpm even after start-up. Shouldn't cold rpm be at least 1000rpm for 20-30 seconds after start if the auxiliary air valve is opening for cold conditions? 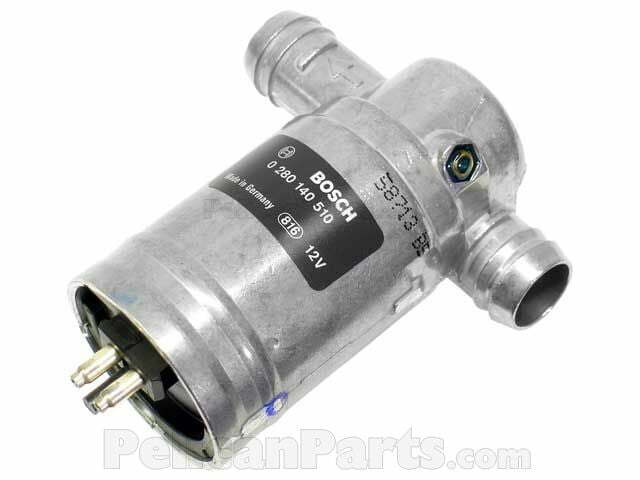 I did all the research I could (MB Manual, Bosch F/I manual, Internet) and never really found a detailed description of how this particular type of Aux Air Valve operated (it's different from the "old" types, or later BMW rotary vane types). It appears to be a rotary vane with a strong elecromagnetic actuator that only rotates maybe 60 degrees, and unpowered snaps back under strong spring force to slightly open, maybe 1/8" open visible through one side). I'd love to know if the valve gets a variable voltage from the ECU, or is simply an On/Off device actuated during the Start Sequence in order to know how to "monitor" it properly during a correct start. I believe the icv does get varied voltage. I've watched one move and its not just open or closed but a smooth motion that can regulate supply. The do sometimes get dirty and finicky. Have you ever replaced the ovp? How old is your battery? It's sounds like you know your stuff but it's easy to overlook. The ICV is free, but I can't say what it's doing when installed, unfortunately. I CAN say it is spiffy clean looking inside, and when momentarily supplied 12v it immediately snaps open with no hesitation with a satisfying "click" then closes when power is removed, and no evidence of sticking at all, so I think the valve is operational. The OVP provides current to the ICV and "looks" new, but again I don't know. The fuse on top is OK. It's hard to monitor every start (with test equip hooked up) when it's not in the shop, and in the shop it seems to usually do fine (of course). Obviously parts substitution would be nice if I had more components at hand. Since the PO said he thought beating on the relays behind the battery helped (he said hard start was seldom) maybe I should just bite the bullet and spring for a new FP relay at least since I cannot check every start unless I wire a small test bulb (like a NOID light) to where I can see it (wired across the start injector, maybe) from inside the car on every start? Last edited by bobinyelm; 01-07-2018 at 02:26 PM. Please let us know your findings. I'm thinking it's a slow to react cold start injector/valve because about 10 seconds after starting it snaps to life, idle comes up to speed and it runs fine. Prior to this happening it's barely runs (maybe 300-400 rpms) and then snaps to life. Rough Idle is almost always a vacuum leak on a 190e. Get a can of start fluid and spray it around the engine bay. When the revs go up start looking for a loose connection or old hose. Likely culprits almost always involve - coolant temp sensor, cold start injector, OVP relay, EHA valve on side of fuel dist, and or vacuum leaks. I just haven't had the time to dig in mine, c.s.injector is next on my list. Car is a 4th vehicle so it just sits..